Place the juice, blueberries, honey and lemon juice into a blender container. Cover and blend until they're smooth. Pour the mixture into an 11 x 7-inch baking pan. Cover the pan tightly with plastic wrap. Freeze for 45 minutes or until the edges of the mixture become icy. Stir the mixture with a whisk. Cover and freeze for 45 minutes. Stir the mixture again with the whisk. Cover the pan and freeze for 3 hours or until the mixture is frozen solid. Scrape the frozen mixture with a fork to form icy flakes. Cover and freeze for 1 hour. 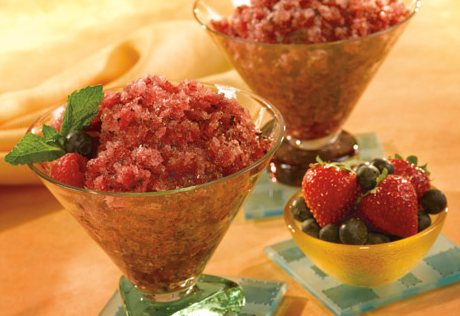 Spoon the granita into goblets or parfait glasses. Garnish with mint leaves and serve with additional fresh fruit.